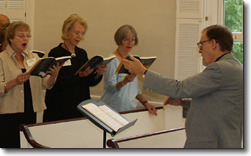 The St. Francis Choir consists of dedicated group of singers, both year-round and seasonal. A dozen voices sing throughout the year and nearly that many more join the choir when parish members “from away” return to the Blue Hill peninsula for the summer season. The choir’s ministry is threefold: to lead the congregation in the singing of hymns (both familiar and new), psalms, and service music; to present weekly anthems in a wide variety of styles; and to function as a caring and supportive sub-group of the larger parish. The choir is directed by Ministers of Music Dr. Carlton and Lorna Russell, who are both professional organists and choir directors of many years experience. The Russells also oversee the care and maintenance of the Anne Parson Memorial Organ. St. Francis houses an outstanding pipe organ by master builder Karl Wilhelm of Mont St-Hilaire, Québec, Canada. Built in 2000 and tonally revised in 2009 by the Andover Organ Company, this instrument is a fine example of the Baroque revival in American and Canadian organ building, and yet is designed to play effectively music of all periods.